Let's recap this month in pictures, shall we? 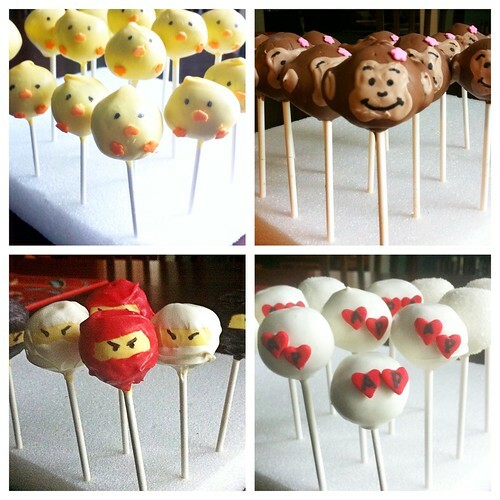 Chickadees, Monkeys, Ninjas, and Betrothal Hearts make for a cake poppin' good time. Note: I only show you the ones that look good. My dear friend Allison got married in Shreveport, LA. It was a divine Southern shindig so everything was monogrammed and included cheese. Rabbit Sidebar: The highest rated restaurant in Shreveport on Yelp is Church's Chicken. Make a note to your traveling self. Warm weather means ridiculous nails. I love it. If you want to be inspired, make sure to follow @xoxo_trina on Twitter. Her fingers always look divine. When Goldfish are BOGO at Publix, I spend 9 minutes staring at the shelves. It was harder to choose a college major. I had an IN-REAL-LIFE meet with blogger Andi Cumbo in Tuscaloosa. She flew down to continue research on her upcoming creative nonfiction book - You Will Not Be Forgotten - about the people who were enslaved on the plantation where she was raised. We sat by the river and I introduced her to fried pickles and white BBQ sauce. I assume her life is better now. It's been the soundtrack of my life this month. More on that tomorrow. So what about you? April - snazziest or dumbest month ever?